SACRAMENTO, Calif. (CN) –After attempting to patch up a humanitarian and political crisis via executive order, the Trump administration resumed its fight Wednesday against California’s “sanctuary state” policies. The dispute between the federal government and the nation’s most populous state bubbled over in Sacramento, a city over 500 miles from the U.S.-Mexico border. The administration’s lawyers tried to convince a federal judge that the state has gone out of its way to obstruct and stymie federal immigration enforcement actions in the Golden State through a trio of recently enacted laws. For nearly six hours, U.S. attorneys hammered home their claim that California has no authority to restrict local enforcement agencies and private businesses from cooperating with federal immigration actions. The hearing in downtown Sacramento was the latest flash in the feud between President Trump and California, a state whose Democratic leaders are committed to resisting the president at every turn. Attorneys for the federal government want U.S. District Judge John Mendez to freeze three new immigration laws signed by Democratic Gov. Jerry Brown in 2017. The U.S. Department of Justice is targeting the signature piece of the sweeping package, known as the Sanctuary State Law. Senate Bill 54 prohibits state and local law enforcement from cooperating with immigration agents without a court order and creates safe zones around schools, courts and hospitals. The federal government is also challenging Assembly Bill 450 which bars California employers from releasing the immigration status of their employees and Assembly Bill 103 which mandates inspections of federal detention facilities operated privately in California. Mendez guided a discussion about each individual law in an extended question-and-answer session. The judge relied heavily on hypothetical scenarios when questioning both sides. While he didn’t issue an opinion, he hinted that sections of the laws could be both upheld and severed. Realizing the magnitude of the high-profile case and the likelihood it will advance past the district court, the George W. Bush appointee said it was important to create a strong record. “We’re the first stop, it will wind through the courts,” Mendez added. The lawsuit, filed March 6, centers around SB 54 or the Sanctuary State law. The policy by Los Angeles state Sen. Kevin de Leon limits but does not prohibit cooperation between California law enforcement agencies and immigration officials. Under SB 54, law enforcement isn’t allowed to give ICE inmates’ jail release dates or personal information under most circumstances. The measure also exempts the state’s corrections system. Lee Sherman, California deputy attorney general, pushed back on the federal government’s claim that SB 54 is a “blanket policy” crafted to wreak havoc on ICE. He noted that agencies can turn over detainees that have committed violent crimes and lesser felonies and that the state has the authority to regulate its own law enforcement agencies. Rather than use time and resources aiding immigration actions, Sherman says the measure has the added benefit of saving money. “It’s not a blanket policy, it allows certain cooperation … and it saves resources,” Sherman argued. De Leon, a candidate for U.S. Senate, snagged a front row seat for the beginning of the hearing. He peered from the jury box while the parties dissected laws he helped write and pass through the Legislature. 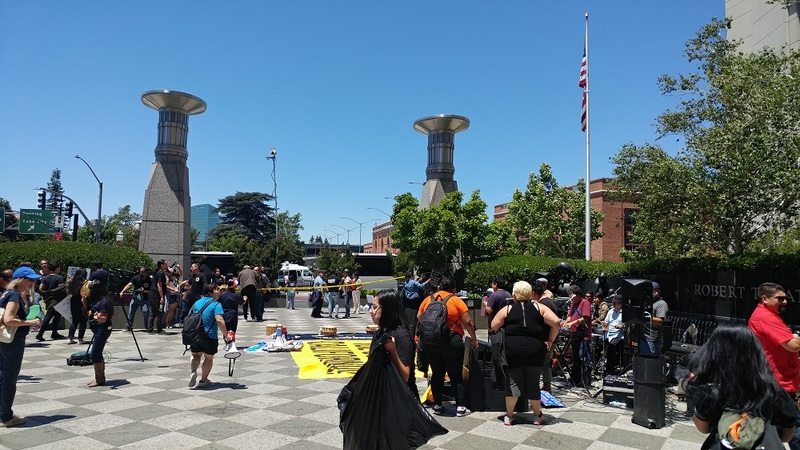 Erez Reuveni, Justice Department immigration lawyer, said that before SB 54 was passed, many California law enforcement agencies routinely complied with ICE and turned over immigrants inside jails. Now ICE has to “stake out” jails at a risk to the public, said Reuveni. “Now that the entire state is prohibited, it’s become a serious obstacle,” Reuveni said. During a back and forth about federal immigration law, the judge noted a lack of precedent regarding the ability of states to dictate cooperation with immigration actions. “You want me to strike down a state law that Congress hasn’t [addressed],” Mendez said to the plaintiffs. The measure requires employers to deny federal immigration agents’ access to their businesses and bars them from giving up employee records without a warrant. Employers can be fined up to $10,000 for violating the Democratic-sponsored measure. “There are some real teeth to the statute, I’m worried about that,” Mendez said of AB 450. California countered that in the past employers were able to deny access to non-public areas and in essence force ICE to come back with a court order. They argued that AB 450 creates a statewide framework for private employers to follow and a way to protect immigrant workers from sudden deportation raids. A flood of cities outside California are backing the state’s defense of the sanctuary laws. New York, Chicago, Minneapolis, Seattle, Portland, Pittsburgh, Philadelphia and Denver have filed supporting briefs against the lawsuit. Mendez has also allowed several California cities and more than a dozen Republican-led states to file briefs in support of the Trump administration’s lawsuit. Dozens of anti-Trump and ICE protesters gathered in front of the Robert T. Matsui U.S. Courthouse before the federal government’s motion for preliminary injunction. De Leon and Sacramento Mayor Darrell Steinberg spoke at the protest, which included dancing, a band and a food truck.